A rail manager "had no time" for proper track inspections before the Hatfield crash, the Old Bailey has heard. 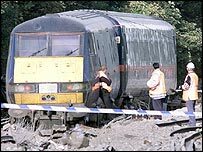 And Peter Lewis, of engineering firm Balfour Beatty, admitted his last check before the crash was useless in assessing overall track safety. Defence lawyers at the trial of five rail executives, who deny manslaughter, accused Mr Lewis of negligence - which he denied, blaming a lack of resources. The crash in October 2000 killed four people and injured more than 100. Three executives from Railtrack - Alistair Cook, 50, Sean Fugill, 50, and Keith Lea, 53 - face manslaughter charges. Two executives from Balfour Beatty - Anthony Walker, 46, and Nicholas Jeffries, 53 - are also accused of manslaughter. Balfour Beatty denies a corporate manslaughter charge. Railtrack, which owned the East Coast Mainline at the time of the derailment, denies health and safety charges. Mr Lewis, a route section manager at the time, was responsible for making sure regular patrols of the track were made. He was also obliged to carry out inspections personally, or make sure one of his assistants did so, every eight weeks. But under questioning from defence lawyers he admitted he had not walked the track every eight weeks, saying: "I physically did not have the time to do it". He also admitted that on 18 September 2000 he conducted a track inspection by himself - this meant he had to inspect the track from the side. He agreed with defence counsel that this impaired his inspection of the top of the rail. "I obviously did not have the best view of that area," he said. But he denied any personal negligence, claiming the company was short-staffed and a full inspection "would be using a valuable resource which we did not have".